Britain's long wait for a men's finalist at Wimbledon goes on after Andy Murray lost a nail-biting semi-final against Andy Roddick. Roddick goes through to face Roger Federer in Sunday's final after a 6-4 4-6 7-6 (9-7) 7-6 (7-5) win. The sixth seed played one of the best matches of his career to prevail after three hours and seven minutes. The turning point came in the third set when Murray fought back from 5-2 down only to lose a tense tie-break. 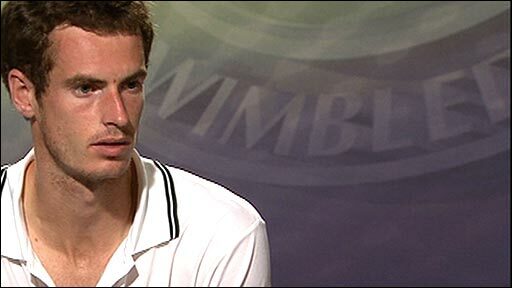 Murray will inevitably look back with huge disappointment on his first Wimbledon semi-final, but he was also able to reflect on a stunning performance by his opponent. "I thought I played well," said the 22-year-old, who held a composed press conference only minutes after walking off Centre Court. "I hit more winners than him, less unforced errors, more aces, it just came down to a few points here and there. "It came down to his serve and he served very, very well. There's not a whole lot you can do. I definitely didn't play a bad match." Roddick's serve was almost impeccable, the American finding an astonishing 75% of his first serves, while his touch at the net, so often a weakness in the past, was rock-solid. 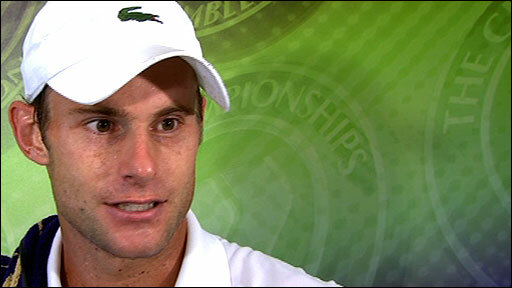 "I had to play my best tennis to win," Roddick told BBC Sport. "I can't say enough good things about Andy's game. But I can play some tennis sometimes. Not many people were giving me much of a chance, but I knew if I could stay the course, I had a chance. "He had a lot of pressure on him, and I could come out and swing, and I think that helped. "He's been a much better player than I have over the last year - I was just a little bit better today." Murray came into the match with a 6-2 winning record against Roddick, including a third-round win over the American at Wimbledon three years ago. But Larry Stefanki, who began coaching the world number six in November, had hinted that Roddick might change his tactics in the semi-final, and so it proved. The American played a patient game from the back of the court, tempering his usual all-out aggression and instead trying to move Murray out of position and induce the error. And with Roddick's serve flourishing in the warm, dry conditions, Murray was unable to make his famed returning prowess count. The Scot, perhaps affected by nerves on his semi-final debut at Wimbledon, struggled with his first serve throughout, and particularly during the first set, but his work off the ground kept him in it. That was until 4-5 when Roddick produced a near-perfect game. At 30-30, the sixth seed turned the tables on Murray, tormenting his opponent in the manner the world number three is used to doing. A dizzying series of searching groundstrokes had Murray off-balance before a delicate drop shot left the Scot scrambling in vain. That gave Roddick the first break point of the match, and he took it - and with it the set - when Murray stretched for a forehand and only found the top of the net. Murray steeled himself. An inspired spell of play saw him win eight of the next nine points, two consecutive aces sealing a 2-0 lead and putting him ahead of the American on aces. He did not come close to another break, but when the chance came to serve out the set, the 22-year-old was calmness personified, finishing it with a big serve which Roddick could only mis-hit into the tramlines. When all said and done, he lost to a better man on the day. Best of luck to Roddick in the final. If he can bring that sort of serving performance back to Centre Court on Sunday, he has an outside chance. The momentum with him, Murray quickly earned three break points in the first game of the third set, but could take none, Roddick saving the last with a stunning backhand volley on the stretch which died on the turf. This fluctuating match swung dramatically back in the American's favour, another deft drop shot earning him the chance to take a 3-1 lead. He grabbed it when Murray's forehand looped over the baseline. The world number three gave full vent to his frustration in the following game when his cry of "come on, pass" was misinterpreted by the umpire as an audible obscenity. But the Scot continued to dig deep, despite his travails, and got his reward when, serving for the set, Roddick faltered for the first time. The crowd chanting his name, Murray took the set to a tie-break, and had a set point at 6-5 only for Roddick to come up with another winning volley, this time a rather fortunate mis-hit. It was Murray's turn to save a set point next, the Briton rocking onto his back foot and caressing a brilliant forehand winner down the line. The shot was inspired, but a mis-hit on the very next point wiped out his good work and gave Roddick an 8-7 lead, Murray netting an attempted pass to leave the American a set away from his third Wimbledon final. With Murray in real trouble, the crowd sensed their moment, roaring their support in the sort of desperate tone which accompanied Tim Henman's matches here. The noise reached fever-pitch as the fourth set reached its climax, but with Roddick's record of winning 25 of 29 tie-breaks this year, Murray's hopes were always on a knife-edge. Trailing 5-3, Murray drew Roddick into the net before passing him with a majestic forehand, which brushed the outside line. 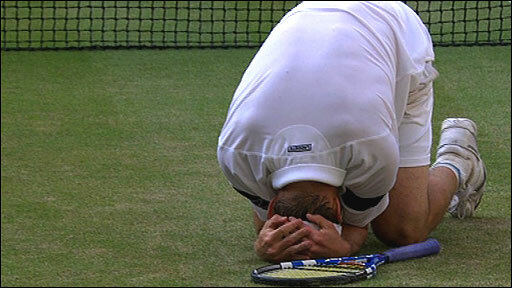 The Scot, though, was left on the brink of defeat when he missed with a forehand, giving Roddick two match points. There was one last magical Murray forehand for the crowd to savour before Roddick sealed the match, the sixth seed sinking to his knees as he celebrated reaching his first Grand Slam final since 2006.